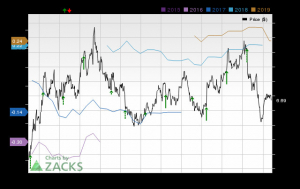 Can Healthy Top-Line Growth Aid Corning's (GLW) Q3 Earnings? Corning Incorporated GLW is scheduled to report third-quarter 2018 results before the opening bell on Oct 23. In the last reported quarter, the company delivered a positive earnings surprise of 2.7%. 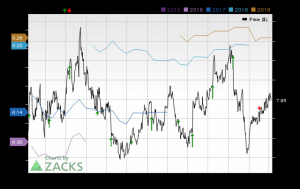 Notably, Corning surpassed the Zacks Consensus Estimate in each of the last four quarters with an average beat of 3.8%. The company is likely to report higher revenues in the quarter backed by healthy growth dynamics. Whether this can result into an earnings beat remains to be seen. During the third quarter, Corning introduced its latest innovation in glass technology — Corning Gorilla Glass 6 — to provide the toughest cover glass available for consumer mobile devices. It announced two additions to its portfolio of cover glass innovations, Corning Gorilla Glass DX and Corning Gorilla Glass DX+, featuring an antireflective property that enhances optical clarity and scratch resistance. Also, the company announced that Guangdong OPPO Mobile Telecommunications will be the first mobile device manufacturer to adopt its latest innovation in cover glass technology — Corning Gorilla Glass 6. Corning expects a step-change in sales and profitability in the third quarter as several of its large capacity expansion projects have exited the start-up phase, and production and efficiency rates are climbing. The company expects pricing environment to be favorable. It expects tax rate for the quarter to be around 21.7%. The Zacks Consensus Estimate for net sales from the Optical Communications segment, which accounts for the lion’s share of total revenues, is currently pegged at $1,069 million, up from $917 million reported a year ago. Healthy revenue growth from this segment is likely to be driven by data center, carrier customers and sales from the 3M Communication Markets Division. For the third quarter, net sales from Display Technologies are expected to be $777 million compared with $768 million reported in the year-ago quarter. Also, for the third quarter and full-year 2018, the company expects LCD glass market volume growth to be in mid-single-digit percentage as television screen size growth continues. It expects its volume to grow faster than the market, driven by the Gen 10.5 ramp up in Hefei, China. Net sales from Specialty Materials are estimated to rise to $412 million from $373 million reported a year ago. While net sales from the Environmental Technologies segment are expected to increase to $327 million from $277 million, net sales from Life Sciences are projected to be $239 million. Consequently, for the third quarter, the Zacks Consensus Estimate for total revenues stands at $2,996 million, up from $2,700 million reported in the year-earlier quarter. Adjusted earnings per share are pegged at 48 cents, up from 43 cents reported a year ago. Earnings ESP: Corning’s Earnings ESP, which represents the difference between the Most Accurate Estimate and the Zacks Consensus Estimate, is -0.42%. You can uncover the best stocks to buy or sell before they’re reported with our Earnings ESP Filter. Zacks Rank: Corning has a Zacks Rank #2, which increases the predictive power of ESP. However, the company’s negative ESP acts as a spoiler.